The Carmel X-series is a range of high power, air-cooled, 780 nm, 925 nm or 1550 nm fiber-based femtosecond lasers with output powers from 0.2 to greater than 1.0 W. With pulse widths of less than 90 fs in a small user-friendly package, the X-series provides the perfect source for a wide range of ultrafast laser applications, including bio-imaging, multiphoton microscopy, optical metrology, 3D-microprinting, terahertz imaging and ophthalmology. The system features a rack mountable controller with a robust armored cable interface to the compact laser head, which facilitates its incorporation into OEM designs. 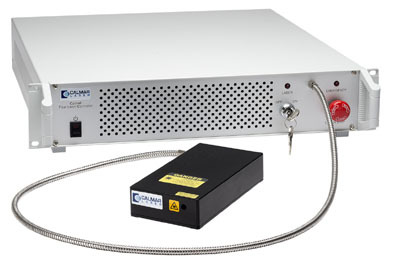 It is over 100 times smaller than many Ti:sapphire lasers with a similar output power level. A simple key switch interface provides for manual operation with full remote access through computer control. The X-series includes the capability of remote data logging, power monitoring, system diagnostics, and automated adjustment of the second harmonic crystal for prolonged lifetime and OEM service support. The rugged design supports 24/7 operation with an expected lifetime of > 10,000 hours. The Carmel can be configured for dual wavelength output to enable alternating between 780 and 1550 nm outputs. The repetition rate can be specified from 10 to 80 MHz with a clean pulse width of < 90 fs, and outstanding beam quality (M² < 1.2). Excellent long term pulse-to-pulse stability (<1% rms) over a wide operating temperature range (17-30°C) ensures superior results for both tissue imaging and ablation in biomedical applications. An RF synchronization output is also provided as a trigger signal. For multiphoton microscopy applications, the Carmel provides an ideal ultrafast laser solution for optimum cellular tissue imaging with minimal scatter and reduced risk of photodamage. The compact laser head and associated armored fiber cable make for straight forward integration into existing microscopes with minimal delivery optics. The building block of the X-series is Calmar’s renowned ultrafast fiber laser seed platform, which utilizes the company’s proprietary passive mode-locking technology developed and perfected over a twenty-year period. This ensures reliable startup, stable long term performance, and many hours of maintenance-free operation. 1 A sech2 pulse shape (deconvolution factor of 0.65) is used to determine the pulse width for the second harmonic autocorrelation trace. 2 The absolute pulse energy will depend on the version and specified repetition rate. 3 For the 780, 1W version, the repetition rate is 80 MHz, otherwise the repetition rate needs to be specified at the time of purchase.